Mary Cain, Alysia Montaño, Robby Andrews And Much More, Including Can The USA Win World Cross-Country? To read last week’s Weekly Recap, click here. We are quite proud of our work this week. We don’t even mention the big news of the week – the Oscar Pistorius news (that story is ongoing, check our homepage) – and we’ve still written a ton that really should be broken up into two pieces and cost you $.99 to read. But it’s here in one piece and free. 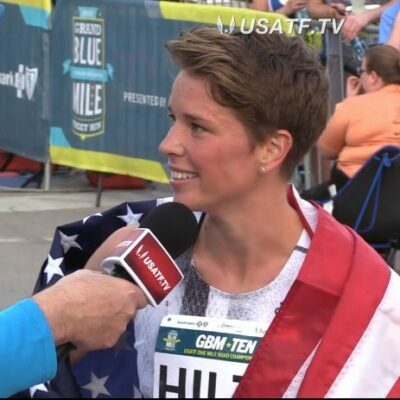 This week we praise Mary Cain for her great tactics, give props to the amazing collegiate milers, including the unheralded Ryan Hill, talk about Bumbalough over Jager (again), tell you that Centro does get tired, wonder if it’s time to panic for Robby Andrews, and tell you that the performance of the weekend came from Alyisa Montaño. 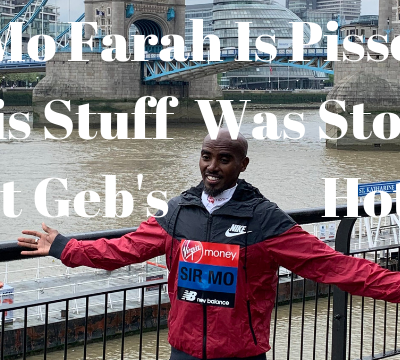 We then start to salivate as to how incredible the 2013 Virgin London Marathon is going to be and ask the unthinkable – can the US beat Kenya at World Cross-Country? Plus will Marta Dominguez ever be busted for being a doper? And google kills off Mary Cain. 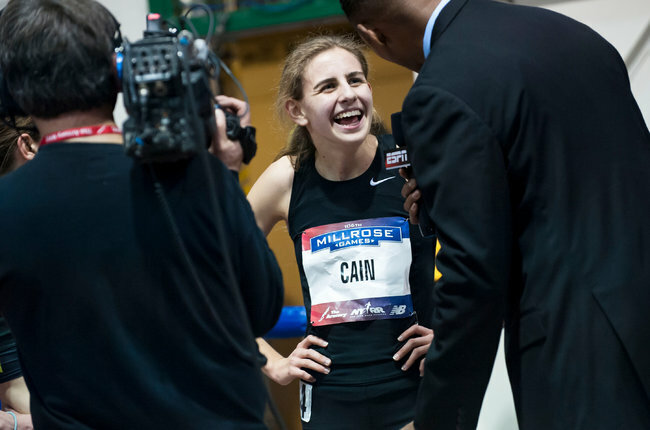 Cain’s 4:28 time at Millrose didn’t surprise us at all as it’s basically almost exactly what her 2-mile time from Boston converted to. The fact that she beat all three of the NCAA stars in the field – Dartmouth’s Abbey D’Agostino, Oregon’s Jordan Hasay and Colorado Olympic steeplechaser Emma Coburn – was a little surprising. To be fair, none of the top American collegians really are mile specialists. While Hasay made her mark as a prep in the 1,500, she’s realizing she’s a bit more like Ryan Hall and needs to move up to the 5k (Hasay may even move to the 10k). D’Agostino has always been a 5ker and the mile isn’t her thing (D’Agostino came in with a 4:34 flat track mile PR) and Coburn is a steepler (4:09 1,500 PR). So statistically speaking, it really wasn’t surprising, but to actually witness a HSer beating America’s top three collegians is different than plotting it out on paper ahead of time. The thing we think Cain has going for her though isn’t her incredibly string of good races in a row. It’s rather that she looks like she’s enjoying the experience. They say a picture is worth a thousand words. Click here to see a larger version of this thumbnail from the New York Times. Either Cain is the world’s greatest actor or she’s got a ton of genuine teenage enthusiasm. Long term, a key thing from this race was Mary Cain once again was great tactically. In Boston, we said she ran great from the back but cautioned everyone that Alan Webb similarly was viewed as a great tactitian in HS. This time, Cain got out of trouble right up front in second at the start, but wasn’t afraid to let the pack swallow her up before re-emerging again late. She showed she’s comfortable running in a pack, which is key. In some ways, tactics are overrated. You normally aren’t going to win a race because of tactics, but you can lose one. A few other Millrose thoughts. Men’s Mile – Collegians Impress, A “Not Tired” Centro Loses, And Time To Panic For Robby Andrews? 2012 NCAA indoor champ Chris O’Hare got the NCAA record but did anyone besides us notice Ryan Hill of NC State ran 3:54.89 – which was 6th. – and just off Miles Batty‘s American collegiate indoor record of 3:54.54. Hill got some attention last year when he ran 7:43 indoors before running 3:38/3:56 outdoors. But his 3:54.89 is a bit better than 3:38 and it now means the NCAA has three sub-3:55 guys on the year as Arizona’s Lawi Lalang was 5th at Millrose in 3:54.56. Anyone that saw this race in person or on TV probably thought that the runner-up Matt Centrowitz was going to win and not Lopez Lomong. On the last lap, Centrowitz was sitting right behind Lomong and seemingly poised for victory as he looked very smooth and not tired, whereas Lomong was grimacing and seemingly fighting with every step. But in the end, Lomong never gave up the lead. Robby Andrews – Time To Panic? Robby Andrews struggles in the mile in the Armory in 2013 continued. In January, he ran a 4:11 clunker. At Milrose, he was a DNF. Thankfully, in between those two races, one the week after the 4:11, there was an encouraging near American record of 2:17.90 in the 1,000. There seems to be little doubt that Andrews is having some sort of mental issue with the mile. In his first race, likely nervous with the longer distance, things don’t go well and he bombs to a 4:11. And then your next mile is Millrose where the guys were really getting after it? You are going to be even more nervous. The leaders were out in 1:53 and the top 6 or 7 were out with them in probably 1:55 or better. If you weren’t ready and in this race from the gun, then you were pretty much out of it by halfway unless you were mentally really strong as there was a huge gap to make up. And Andrews is a known come-from-behind guy – which works well assuming there is only one pack – here there quickly were two. Also, it’s possible that he’s just not quite ready for this type of race. We convert his 2:17.90 1k to about 3:55.35 in the mile but the 1k is much more of Andrews’ event. He needs to really be on his game to run 3:55. Running 3:56 at Millrose coming from behind is hard to do when the guys in the race are all going out at 3:50 pace. We know he likes to come from behind but it mentally would have been a lot better for him to pull a Mary Cain and get right in this race at the start to get into it. But that’s easier said then done, especially when you are lacking confidence and like to come from behind. The critics have gone ballistic on the message boards but it’s certainly not time to panic by any stretch of the imagination. There is nothing wrong with being in 2:17 1,000 shape in February. Andrews very well could be like another notoriously inconsistent former Jason Vigilante-coached runner, Leo Manzano. If Manzano is in a race where he has a chance to do well – if he’s in it to win it – he’s often lethal. If he’s in the back of a time trial, it’s often a disaster. Going pro early is brutal as there are no real easy marking posts. If he was in the NCAA system, it might be easier to slowly develop (Mary Cain is thriving as she’s running in races that are perfectly set up for her to do well. If she’s in Europe running in 4:00 races, it might be a different story). Far from stellar. In case you didn’t know, he got the Olympic silver medal. 1) Andy Bumbalough has beaten Olympic steeplechase finalist Evan Jager both times the training partners have raced so far in 2013. We guess that shouldn’t surprise us too much as both races were very close and the 25-year-old Bumbalough has 3:37 and 13:16 PRs. Any chance Bumbi can learn to hurdle? Bumbalough clearly is a talent who may not get the publicity of some of his training partners. The 25-year-old has been 4th at the last two USA meets in the 5k. He was a former Foot Locker runner-up in HS. He’s less of a name, though, because he never won an NCAA title nor was he always in the mix for one like Chris Derrick. NCAA-wise, he was 2nd in the 3k in 2008 and the third in 5,000 as a senior in 2010. 2) Hard not to be impressed by Bernard Lagat‘s 8:09.49 AR at age 38. He now has all of the AR indoors for the distances – 1,500, mile, 3,000, 2 mile and 5,000. Enjoy it while it lasts, Bernard – Galen Rupp may get one back this week in Stockholm. Lagat isn’t the only ageless wonder. In Britain, 39-year-old Helen Clitheroe won the women’s 3,000. Ironically, Clitheroe was the only person in the field who didn’t PR. Good to see the unheralded Eric Sowinski get the win and American record over Olympic stars Duane Solomon and Nick Symmonds. We thought given the fact that Symmonds hadn’t raced this year, had been sick and it was only 600, that he wasn’t going to win. That proved to be true. Also we’ve thought all year the 600 record was soft and in a weird way Sowinski’s grabbing of it proves that. The new 1:15.61 AR equates to 1:46.59 for 800 in our book, a time certainly that is doable for the 1:45.90 man Sowinski. Speaking of Sowinski, how about this picture that meet director Ray Flynn tweeted out? For the record, if you don’t know Sowinski, he ran at Iowa and was 2nd at the NCAA outdoor meet last year (3rd indoors) in a PR of 1:45.90 before bowing out in the semis of the US Olympic Trials. Performance Of The Week: Women’s 600: Alysia Montaño Runs A 1:57+ Equivalent!!! Now the women’s 600 record was very soft. That being said, Alysia Montaño obliterated it by 3 + seconds. Her mark is actually very good on the conversion charts. For starters, she just missed the world indoor record of 1:23.44 and it’s the 7th-fastest 600 ever run indoors or out in history. For comparison’s sake, Sowinski’s mark has been bettered more than 50 times in history. But it’s not ridiculous. First of all, 600 is probably an ideal distance for Montaño, who basically gets out fast as hell and hangs on in her 800s. Secondly, she has a history of running very fast right off the bat. Last year, she opened up in the 800 with a 1:57.37 at Pre. Her seasonal best for the year? You guessed it – 1:57.37. Simple answer. Money. Montaño’s Nike deal expired last year and she hasn’t re-upped with anyone. So why not go to Millrose make some money in the process and put up a great performance to try make some waves that make a shoe company want to pay you more. Alysia – you should have contacted us before the race. We would have loved to have our LetsRun.com T-Shirts get an American record. 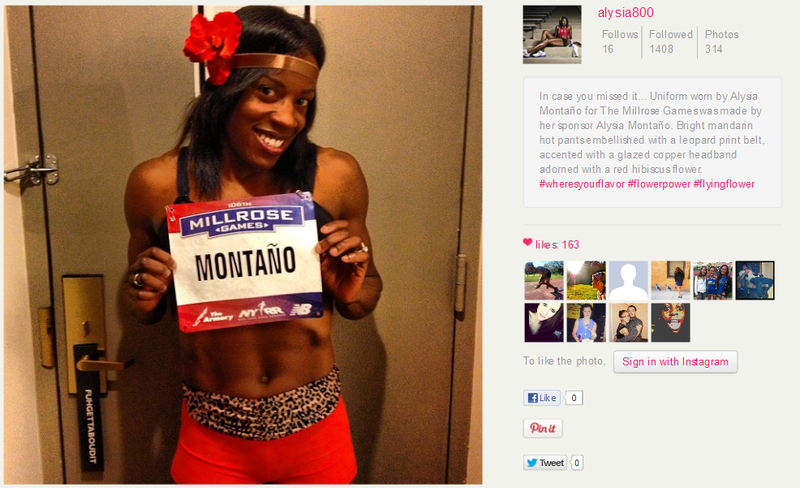 More: MB: Alysia Montano unattached?! We’ve got the video below set up to show the last 300 meters of the 800 from the meet in Birmingham and tell us how a disqualification wasn’t warranted. You take a guy out from behind at the finish line and there isn’t a DQ? A disgraceful decision really. The 2013 RAK Half Marathon – A London 2013 Preview? The world’s fastest half marathon was last weekend – The RAK Half Marathon – and the 2013 edition produced a record-breaking day as for the first time ever, 3 men broke 59:00 in a single race and 4 women broke 67, 6 broke 68 and 10 broke 69. We had two thoughts after seeing the results. 1) Geoffrey Kipsang could potentially be the best runner on the planet right now – will he possibly be named to Kenya’s world cross country team as a wild-card? You can read more on that here, but the answer seems to be yes. 2) My God, the 2013 Virgin London Marathon is going to be incredible. 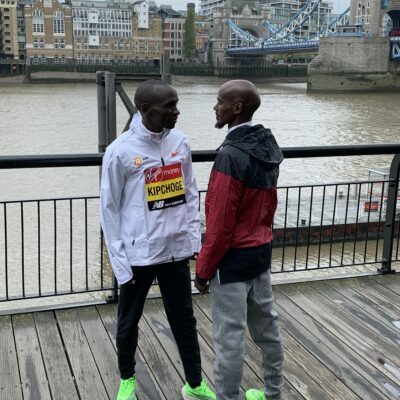 We already knew that the London organizers had secured arguably the greatest set of marathoners in history and now we know many of them are in supreme shape roughly two weeks before the race. Three of the top five men and women finishers at the RAK Race are committed to London as shown below (the # next to their marathon PR is where they are seeded based on time in their marathon). 1. Geoffrey Kipsang (KEN) 58:54 – ? 5. 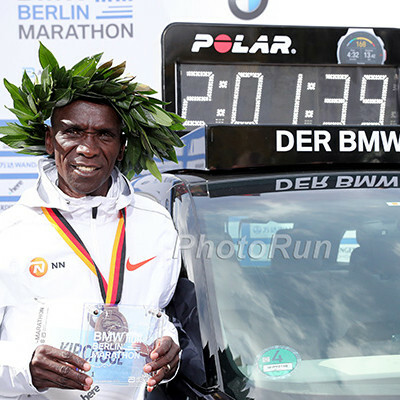 Stephen Kibet (KEN) 59:59 – ? *LRC Geoffrey Kipsang: The Total Stud Who Could Win World XC, But Will He Run It? Could The US Possibly Beat Kenya At World Cross-Country? How far has US distance running come in recent years? A long damn way. So far in fact that we decided to compare the US’s top 4 from the US XC champs to Kenya’s top 4 to see if there way any-way the US could possibly win (the IAAF stupidly scores only 4 instead of 5 for XC). 1 Philemon Rono 8:02/13:36/28:25a/60:58. Age 22. 1. Chris Derrick – 3:41/7:46/13:19/27:31. Age 22. 3. Matt Tegenkamp – 3:34/7:34/12:58/27:28. Age 31. 4. Elliott Heath – 3:40/7:45/13:26. Age 24.
Who has the edge on paper? #1 man. Edge: Even: They are the same age and 27:31 and 60:58 are very similar on the conversion charts. #2 man. Edge: US. Ritz is younger and has better PRs. (Tilastapaja lists Kipsang as 33 but Kip Evans of http://runafricadotcom.wordpress.com/ says he’s 28). #3 man. Edge: Kenya. A 26:55 at age 19 is remarkable. Plus he’s entering his prime versus being past it. #4 man. Edge: Kenya. Better PRs. Overall: The US is unlikely to send everyone and the race isn’t on paper, so we expect Kenya to destroy the US, especially if a star like Geoffrey Kipsang is added to the mix as we mentioned above. But what if in two years, the US sent all of it’s very best? And Kenya sends a watered down team. With so many Kenyans opting for making a living on the roads than running for their country for peanuts in cross-country, a US victory isn’t totally beyond comprehension. 1 Margaret Muriuki 4:06/8:37/14:48. Age 26. 2 Irene Cheptai – 21 year old ran 9:22 in 2007. 16:08 at altitude last year. 3 Janet Kisa – 8:51/14:57. Age 20. 1. Shalene Flanagan. 4:05/8:35/14:44. Age 31. 2. Kim Conley – 8:56/15:14. Age 26. 3. Deena Kastor – 8:42/14:51/30:50/2:19:36 – 40 years old. #1 woman. Edge: US. A tough call as the two are very close in terms of PR and the Kenyan is 5 years younger but Flanagan has a world xc and Olympic medal behind her. #2 woman. Edge: US. Cheptai is a total unknown for the most part so this is a bit misleading. #3 woman. Edge Kenya. Kastor has the credentials but how does a 20 year old sub-15 runner lose to a 40 year old? They don’t. #4 woman. Edge Kenya. Nothing like having the 2010 world xc champion as your #4. Overall: Flanagan isn’t going and Kastor is running a week after a marathon, so it now looks like a Kenyan romp. From late 2010 to early 2011, one of the big stories in the world on the anti-doping fight was that 2009 world steeplechase champion Marta Dominquez was one of 14 people detained as part of the Operation Galgo doping investigation. While she was arrested in December 2010, it came out that sources said the IAAF had long been suspicious of her blood profile (*Read this great translation of an article by LRC visitor Stewart Atkins: IAAF Long Suspicious of Marta Domínguez). LRC erupted in a 21-page discussion thread on doping and Dominguez. Given all of the EPO use originating from Spain in cycling, most were not surprised by the developments. However, in April of 2011, Dominguez was cleared by a Spanish court. But in our minds, a lack of a conviction doesn’t mean one is innocent – think of Roger Clemens. Clemens didn’t get convicted criminally but most sports experts and ourselves believe he was a doper. The AP reported that the Spanish judge at the time said there was “no rational evidence” that she had committed a crime, but if you dug a little deeper and read the Spanish sources, you realized the criminal case involved being a drug trafficker and not just a PED user. The whole thing was certainly unsettling and we’re sure that some doping apologists, lawyers, people were upset the thread on her “clearing” was only one page long, but for us it certainly didn’t mean she wasn’t a cheater. There is a difference between being a drug dealer and user. Also a criminal conviction requires a ton of evidence. But it was all very complicated and only big news in the Spanish press. Making it more complicated is the fact that Dominguez is active in politics (since 2012 she has been a Popular Party senator) and after she was cleared it was alleged by her supporters that she had been framed by the local ruling party. Well, guess what? Now Dominguez is being linked to a second doping scandal as it’s being claimed she was a client of Operation Puerto’s Dr. Eufemiano Fuentes from at least 1997. Domínguez’s name also appears to be linked to sheet 755 of the Operation Puerto indictment, which shows a schedule headed with the reference MZD 2005. That year, the long-distance runner began training in May after recovering from an injury. The schedule shows that the patient was meant to begin with an EPO treatment and a blood extraction on May 2, continuing until June 14. On that day the administration of IGF-1 on alternate days was due to start, continuing until August 3. The dates marked as important competition days – with three vertical arrows – coincide exactly with Domínguez’s schedule for that year: June 4, Seville; July 8, Rome Golden Gala; July 16, Madrid; August 10-13, Helsinki World Championships. Four days before competitions, a reinfusion of two bags was scheduled (marked with an R). In Helsinki, Domínguez reached the final of the 5,000 meters where she finished 14th, which she attributed to the little preparation time she had had following her injury. The reality is this accusation isn’t really removed from the first. In addition to the photocopied document and calendar, there is one more piece of evidence – a bag of blood that allegedly belong to Dominguez that dates from 2006 and is linked to Dr. Eufemiano Fuentes and Operation Puerto. It was the existence of this blood that kick-started the first investigation as the blood’s existence enabled prosecutors to get a judge to allow them to wire tap Dominguez phone in 2010, which led to her being accused of being a drug trafficker. The big debate is whether a judge will require DNA testing be done on the bags of blood. So far he hasn’t and the cyclists involved have refused to voluntarily be tested. But again, to us, it comes down to the difference between being criminally cleared and being innocent. We don’t believe Dominguez was innocent. Can we prove it? No. Now please don’t say we are jumping to conclusions. If Dominguez truly never cheated, in this case, there is an easy solution. She can prove her innocence by demanding that the DNA test be done. More: 2013: *Was Domínguez a Puerto patient? *MB: Dominguez and Bezabeh cleared, vindication! – Mary Cain talking to the New York Times. Note: This actually was briefly quote of the day on Monday before the Oscar P. steroid allegations surfaced and we took it off. Why schools and other entities clam up and circle the wagons, like the University of Toledo did in the recent case involving track and field/cross country director Kevin Hadsell, instead of simply coming clean always amazes me. Hadsell had inappropriate relationships with female athletes. There. What’s so difficult about that? Instead, UT initially would say only that he violated school policy while insisting there were no NCAA violations, which may be true, and that it did not involve or reflect on the running program, which is untrue. What UT’s typical approach – you might have thought it would have learned from the Gene Cross saga – invited was investigations by newspapers and Internet sites and, boy, did it get one of each. The Blade’s report landed on the front page and another was plastered as the lead item on Deadspin.com, which does not have to worry about such trivial things as good taste. Hadsell’s behavior merited his being fired and had he not resigned that apparently would have been the outcome. It was a shameful end for a coach who built a tremendously successful program. – Toledo Blade columnist Dave Hackenberg. We 100% agree that schools owe more than letting coaches resign when there are serious problems that likely would lead to a firing. We disagree when Hackenberg says there is no point to schools covering this up. There is a point, many schools do this and get away with it. Need an example of how it should be done? Look no further than good, ol’ Mike McGuire, head coach of the women’s cross country team and distance squad. McGuire was not interested in the particulars of our relationship drama, went red if he ran into us outside of practice, spent his downtime working on his golf swing, and if he had concerns about our weight or personal lives, he had his female assistant coach talk to us about it. He was serious about his investment in our running careers. That was his job. He was my coach. He knew when to push me and when to call me out for half-assing a workout. He knew what I could handle on race day and what he needed to say to me a half-hour beforehand to inspire me to perform. It’s a delicate art dealing with so many neurosis on one team, but a mentor, a true leader knows how to pull out the best from each of his athletes without needing his own ego stroked at the same time. We’ve all got better things to do. – Rachel Sturtza, freelance writer living in Denver, Colo., and former runner for the University of Michigan, who graduated in 2003, writing for Runner’s World. – Lukas Verzbicas talking in an ESPN.com feature on him. The way Verzbicas left Oregon really rankled us and we were amazed that the “grown-ups” didn’t advise him better, but the more we read about him, the more we are impressed. Not many teens – wait, he just turned 20 in January – can admit mistakes. And even before that, we liked how he was very cognizant of the fact that people didn’t like the fact he was old for his grade so he graduated a year early. – 2008 and 2012 Olympic 100 champ Shelly-Anne Fraser-Pryce speaking prior to her indoor opener in Birmingham last weekend. She did set a personal best – actually twice, as she ran 7.19 in the prelims and 7.09 in the final, beating Olympic 100 silver medallist Carmelita Jeter in the process, but losing to Murielle Ahoure. Go into google and type in Mary Cain. That’s what a website visitor urged us to do recently. The result is a bit unsettling at first glance. Look at the far right. Google says Mary Cain is dead. Admittedly, it’s a different Mary Cain but the photos are for the running Mary Cain. LRC USATF Gets Into The Road Race Business With The .US National Road Racing Championships Starting this year, USATF will own and operate the season-ending road race to the USA Running Circuit (USARC). It will be a mass participation event over 12k that includes $100,000 in prize money (with $20,000 to the winners). We break down the announcement for you. A Interesting Read Rojo’s “No Question Goes Unanswered” Interview With Women’s Running Website – Saltyrunning.com Rojo goes back to the beginning and shares the co-founders vision for the site. He is unfazed when asked if LRC is “elitist, anti-hobbyjogger, and anti-women,” he reveals the secrets as to how the site is made each day, and he defends the no registration policy of the message boards. – Mary Cain talking about her 4:28.25 mile at the Millrose Games, which got her 2nd place and crushed her own high school national record. “That’s what’s great about track. – Nick Symmonds talking about the unheralded Erik Sowinski defeating Symmonds and Duane Solomon in the 600m to set the American record at the Millrose Games. – Nick Symmonds, who will be racing the 600m at the 2012 Millrose Games tonight. 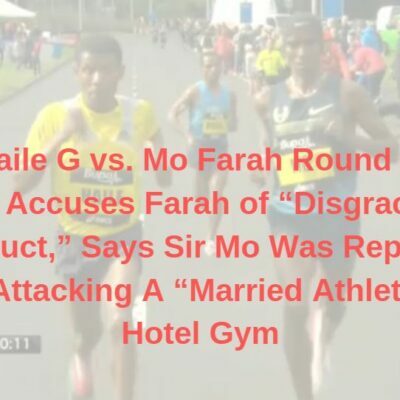 – South African police discounting the rumors that circulated initially that Oscar P likely thought he was defending himself from an intruder. Later in the day, it seemed that theory lost even more steam when it was revealed the deceased entered Oscar’s residence at 8:15 pm and was killed at 3 am. – Lieutenant Colonel Katlego Mogale of the S. African police confirming that Oscar Pistorius has been charged with murder in shooting death of his girlfriend Reeva Steenkamp. – Ginger of women’s running website SaltyRunning.com, writing in the intro of a no-holds-barred interview with LetsRun.com co-founder Robert Johnson. – Bernard Lagat talking about his expectations for the Millrose 2-mile this weekend. He wants a fast race, but has made it clear that doesn’t mean he is going for the WR. – Usain Bolt talking about the season-opening 400 he ran in Jamaica this past weekend. He won his heat in 46.74, but lost to Warren Weir (46.23) and Yohan Blake (46.64) in the overall results as they went 1-2 in another heat. It was Bolt’s first 400 since February 2010, when he ran 45.87.